How to change my account informations ? Your credentials are private. If you give them to another person, you take responsibility. VeryGames admins will never ask them to you. To change your informations, go to MY ACCOUNT. In the MY PROFILE menu, click on MY INFORMATIONS. You just have to change what you want then confirm by clicking the button UPDATE. An email will be sent with a verification code to insert on the site. It is not possible to change the name and date of birth of a VeryGames account. To change this information, send a ticket to our support. You will then be asked to prove your identity by sending a scan or photograph (For example: with your mobile) of your ID (eg passport, driving license, ID ...) to support@verygames.net. What is VeryGames doing with the document ? I have no confidence in sending documents through Internet. VeryGames understands this lack of confidence when sending important documents. The customer can completely delete the information it does not want to show. However, the document should still remain recognizable and the name and date of birth visible. All collected personal data is not retained or used for any other purpose than simple control of payment.The information provided will remain strictly confidential and will not be used for commercial purposes. When you change your account information, an email is sent with a verification code to insert on the site. If you no longer have access to your mail, you will not be able to save your changes. Therefore, a VeryGames administrator must change your email account manually. You must then send a support ticket, specifying the new email that you want instead. NOTE : il ne faut pas fournir un email qui est déjà utilisé sur un autre compte VeryGames. Upon receipt of this document, VeryGames administrator will change your email account. In the MY PROFILE menu, click MY PASSWORD. How to send tokens ? You can send Tokens to another VeryGames user for free. In MANAGE MY TOKENS menu, click SEND TOKENS. Put in "e-mail address of the VeryGames account", the email of the person you want to send Tokens to. Put the number of tokens to send. Then click on SEND TOKENS. WARNING: This action is irreversible. In any case, you can claim your Tokens back. How to recover tokens from the V1 site ? You can transfer the tokens you have on your account on the V1 site for free. Go to MY ACCOUNT on the V2 site. In the MANAGE MY TOKENS menu, click on SEND TOKENS. Put in "E-mail account on www.verygames.net", your VeryGames V1 email account where the tokens you want to recover are placed. Put the number of tokens you wish to transfer. You must therefore have access to the email address of your V1 account. 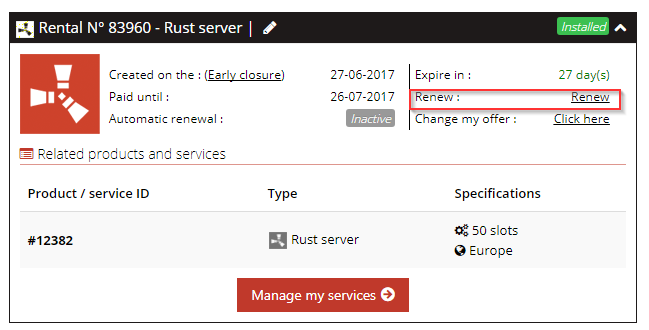 How to renew my service ? To renew your service, go to MY ACCOUNT. If you wish you can change your frequency. NOTE : some payment methods may be dimmed. For example: TOKENS, if you do not have enough tokens to pay for your order. In the MY ORDERS section, click RENEW. NOTE : You can select multiple services. Si vous le souhaitez vous pouvez modifier votre périodicité. How to do an offer change? The change offer is a service which allows you to change an offer to another one freely. You do not have to pay any supplement, only the expiration date will be modified according to the new chosen offer. NOTE : All your datas and the server’s ip adress will be kept. When your change offer is done, you cannot have a refund, even in tokens. One offer change every 30 days (unless you have the option Flexi+ or an Instant change offer Pass.). To make an offer change, you have to go to your My account tab. Click on the link Click here , in front of Change Offer . Caution : if you have a Paypal subscription, you have to cancel it before. You do not know how to cancel your subscription? Click here. NOTE : if you do not have enough days lasting on your rent, you will get this message : Your remaining days number to make this offer change is not sufficient. You need to have a minimum of X day(s) to be able to make it. At the moment, you have X day(s). You will need to renew your service before making the offer change. You arrive on a summary page of your old and new offer. An email will be sent to you with a check code to insert on the site. NOTE : if you do not insert the code, your offer change will not be validated. Click on Offer change history, on the left menu. NOTE : Once a service has expired, the history of this one does not appear anymore. On our website, you can change your offer for free every 30 days. With the Flexi+ offer you can change your offer once every 7 days, instead of once every 30 days. How can I get Flexi +? When you rent a service, simply activate the Flexi+ offer. I forgot to activate it when I rented my service, can I still activate it? Yes, you just have to do an offer change and select the option. What is a VeryGames Pass ? VeryGames Pass allows you to perform a particular operation on your services. This pass allows the client to make an immediate offer change. The change offer is a service which allows you to change an offer to another one FOR FREE. You do not have to pay any supplement, only the expiration date will be modified according to the new chosen offer. When you choose an offer with several servers and you wish to remove one or several servers, you have to delete the servers you don't want anymore, before doing your offer change. CAUTION : EVERY DATAS, BACKUPS, IP ADDRESSES of the servers you delete WILL BE PERMANENTLY LOST ! 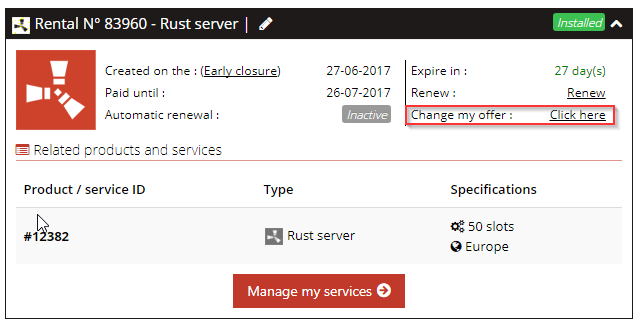 To delete your servers permanently, you have to do an offer change, and choose the new offer you want. Click on the link Click here, in front of Change Offer .